This week we are celebrating World Environment Day (today!) AND World Oceans Day (June 8). The theme for both in 2018 is “Beat Plastic Pollution”. If you can’t reuse it, refuse it! Purple hermit crab using a bottle top for a shell. Photo: Jenn Lavers. Reduce single-use plastics. They’re everywhere… Bottled water and soft drinks! Plastic bags! Straws and cutlery! Balloons! Many of these can substituted for a multi-use option or avoided altogether. If this happens enough, retailers will get the message and find alternatives. Avoid products that contain microplastics, such as many cosmetic products. Pick up rubbish from the beach when you visit and save it being washed back out by the tide. Join the global #BeatPlasticPollution game of tag. Invite friends and colleagues to take a selfie with their canvas shopping bag, metal straw or any other reusable product and tag five friends, telling them to do the same. The person tagged should post a photo with their reusable item within 24 hours. Carry out a plastic audit of your home or business to see where you can reduce your plastic usage. Set targets and make a plan to achieve them. If you’re a teacher, lessons plans can be found on the World Environment Day website to teach your students about the issue. Today, millions of people in over 100 countries will be celebrating the natural environment and taking action to reduce their impact on the planet we all call home. What will you do? Flatback turtle caught in a ghost net in the Northern Territory. Photo: Jane Dermer, GhostNets Australia. Plastics ingested by short-tailed shearwaters, Australia's most abundant seabird. Each number on the grid represents an individual bird. Most of the short-tailed shearwater population carries these small plastic loads in their gizzard. Photo: Lauren Roman. We would like to share with you the most wonderful rehabilitation story about a King Penguin that was nicknamed "Noddy". Noddy was found in a very unwell state on the Tasman Peninsula in south east Tasmania. Luckily she was rescued promptly and went into care with local seabird expert and wildlife carer Lesley Kurek. After weeks of intensive care and supportive nutrition Lesley had done the most incredible job of getting Noddy's health back on course. Noddy then decided to go in to "moult" (which penguins do once a year). Unlike most birds that will moult a few feathers at a time, penguins moult all of their feathers all at once in a short space of time (around 3 weeks) - which is quite a sight to see! They are not waterproof during this time, so Noddy had to stay put until her feathers had all grown back. 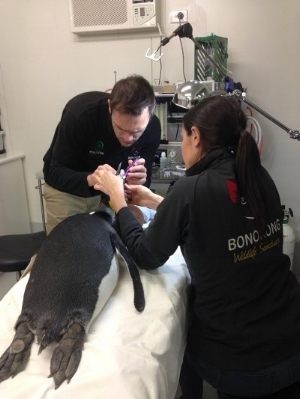 Once Noddy had finished moulting it was time for her to come to Bonorong to be tested in our large saltwater pool and have a final vet check in our Wildlife Hospital. A huge shout out to Lesley for the incredible rehabilitation effort with this bird. We are so pleased we could help in the small capacity we could, but this just shows you the sort of commitment and dedication that our local wildlife carers put in for animals in need - all voluntarily and off their own backs! Today - 3 March - is World Wildlife Day! To celebrate, we’d like to introduce Freddo, one of our resident Tasmanian Tree Frogs. Freddo was excited to hear that his brand new aquarium arrived this week, ready to be fitted into the bigger facilities being built for him and his froggy friends. Freddo, one of our Tasmanian Tree Frogs. Many visitors to Bonorong may not know that we have frogs onsite, as they are kept off-display in a specially-designed quarantine facility. The species is highly susceptible to the fungal infection chytridiomycosis, which has caused the extinction or population decline of hundreds of frog species around the world. With support from the Tasmanian Government and NRM South, Bonorong is keeping a small number of the frogs in captivity in an attempt to better understand the species. This knowledge will be crucial to saving the species if wild populations begin to fall. We’re pretty excited to be involved in this work, and to see the new facilities begin to take shape. Especially exciting is the chance to share this unique Tasmanian species with our visitors – yes, some of our frogs will be going on display later in the year! Keep an eye out as you may just be lucky enough to come nose-to-nose through the glass. In the meantime, what can you do to help our native frogs? Clean boots and camping equipment of soil and allow to dry completely before visiting remote areas. When disposing of water within a natural environment ensure you are as far as possible from creeks, rivers, ponds and lakes. Never move frogs and tadpoles to new locations. Never release frogs found in imported fresh produce (usually banana boxes) and nursery products. We had the absolute pleasure of hosting the incredibly talented Alex from Houndstooth Studio by Alex Cearns at the Sanctuary this week! 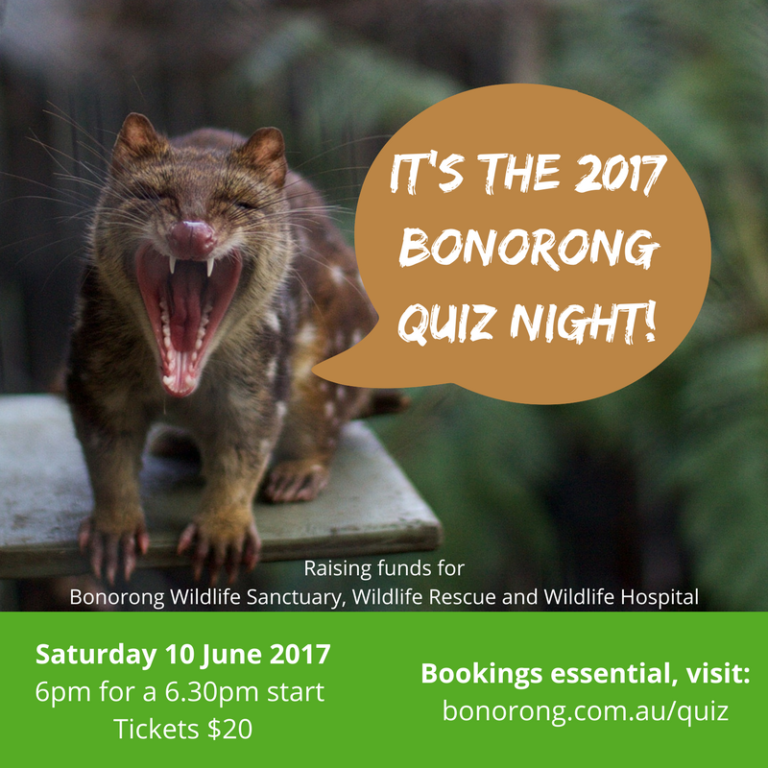 A huge thank you to both Alex Cearns and Debora Brown for their amazing ongoing support and fundraising work they have done for Bonorong. These people are salt of the earth and will be selling photography prints soon to raise much needed funds for the continued operations of our Bonorong Wildlife Hospital. Keep an eye out on our page as we will let you know how to get your wombat fix as a number of gorgeous prints will be available to buy very soon! Remember to support good businesses that support good things and if you can take the time to send them a message or email to thank them for supporting Tassie's special creatures then do! This is a photo of dear Mariah the wombat midway through the shoot, taking a small leg cuddle because when the arms are too far away the legs are better then nothing! We are sure most of you have seen by now that an incredible dream finally came to reality last night, a dream that started five and a half years ago! Our little wildlife sanctuary has finally done it: we have built Tasmania's first Wildlife Hospital! "Evening everyone! I just wanted to say another massive thank you to all of our staff, donors, supporters, rescuers, carers and the rest of the world for helping get the Bonorong Wildlife Hospital finally open. If you haven't had a chance to watch the video of our grand opening event last night then please take the time to watch it when you can. A lot of people deserve all of our thanks and we hope you can support the people that supported us in return - they deserve it! To our Bonorong staff members, please remember it is all of you that made it possible! You are all the most important thing that Bonorong has. Just think of the 30,000 animals you have helped to rescue and rehabilitate in the last few years, these animals would thank you so much if they knew how to. To the amazing folks that are our donors, we can't wait to show you the results that this hospital will bring for wildlife in Tasmania and what you have helped achieve. To our rescuers and all wildlife carers a huge shout out to the work you do under emotional stress and the time and money you all put in, I hope this helps your success rates and helps the stress with knowing the best care possible can be reached when needed in our dedicated facility. And finally thanks to our supporters and visitors, whether you like it or not, you are all a part of everything we achieve and we could not do the work we do without you! Exciting times are ahead to see what other goals we can kick for wildlife & conservation in Tasmania now that this dream is a reality. Thanks so much team, cheers - Greg"
You can watch the video of the opening on Facebook, and check out some of the photos of the opening below. Phoots thanks to Matthew Burniston, Barrie Irons, Vica Bailey and Matt Thompson. Thank you for all your votes (in the form of likes and shares) and thank you to our judges for making a decision! Well, kind of. They actually couldn't agree on a single winner - so they have chosen TWO winners!! Congratulations to Zaylee Saint and Samantha Madeleine for their winning contributions! We'll be in touch to finalise the finer details. And don't forget - pre-orders for calendar close THIS WEEKEND (11.59pm Sunday 22 October 2017). Psst - just want to pre-order your calendar? Head here! To submit your favourite photo and enter for your chance to feature in a month of your choosing, simply email your photo to: calendar@bonorong.com.au before 11.59pm on Sunday 8 October. We’ll then put together a ‘finalists’ gallery on Facebook, and let the public have their say on who should win! So what are you waiting for? Pre-order your calendar now, and send us your best photo! By entering the competition you are providing Bonorong with the right to use your photo in the 2018 Bonorong Calendar, should you be chosen, as well as in any promotional marketing for said calendar. If there is an identifiable human in your photo you must have their express permission to enter the photo knowing that their face may be somewhat famous, at least for a year. The winner will be determined by the combination of two parts - 50% weight will be given to public voting (the number of ‘likes’ per image) and 50% weight will be given to Bonorong judges marks (based solely on opinion). You do not have to pre-order a calendar to enter, but we recommend you do because it’s going to be ace. The winning prize is your photo being published and distributed in the 2018 Bonorong Calendar. This cannot be exchanged for a cash value (as clearly it is priceless) and no payment will be provided to the winner. The copyright for the photo will at all times remain with the photographer. The Bonorong Food Hut is Open! It has been a long time in the making, but we are EXTREMELY excited to announce that a project we have been working on behind the scenes has finally come to fruition! Ladies and gentleman the "Bonorong Food Hut" is now officially open! Open daily for lunch, our Food Hut team are serving delicious environmentally friendly, vegetarian friendly and vegan friendly food. The hut's opening hours are still a work in progress, but we will be open from at least 12pm-2pm daily (hours will change coming in to our peak season, so contact us to enquire if needed!). Take home meals are available too, so you don't even have to enter the Sanctuary to enjoy a delicious snack! Simply head to the side window facing the car park and one of the Food Hut team will greet you there. Another option could be if you are heading past Brighton (say on your way from Hobart to Launceston) you could easily drop in to grab a meal from us on your way through. Our "hot meal" menu options will change weekly (so there is always something new to try!) and there will be our regular favourite dishes daily as well as some sweet treats too. 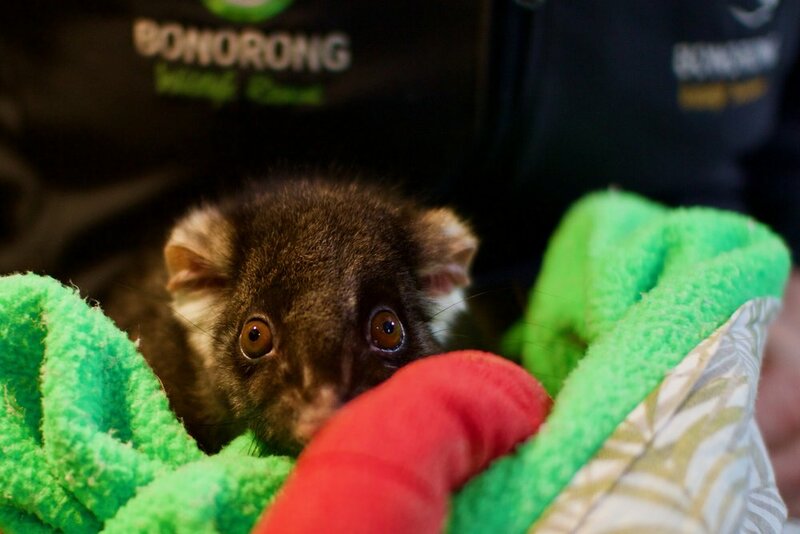 We hope you will support the Bonorong Food Hut on your next visit to the Sanctuary, see you soon! We write to you today with heavy hearts. "Fidget" our beloved resident brushtail possum has passed away. He hadn't been acting himself the past couple of weeks and our vet discovered an abdominal mass that we suspect to be cancer. He had surgery on Saturday, but sadly didn't pull through. The staff at Bonorong are understandably devastated by the loss. If you knew Fidget please give him a loving thought today and feel free to share a photo in his memory on our Facebook page. Bonorong is very pleased to announce an exciting partnership with TasNetworks. The company approached Bonorong with the prospect of helping injured raptors and it was decided that a focus was needed in developing specialised rehabilitation options at the Sanctuary. Tas Networks have funded the building of three raptor holding facilities suitable for temporary care of all raptor species, whilst awaiting veterinary care or recovery. They are also funding two veterinarians to head interstate and undertake training in very specific areas of raptor rehabilitation, which will mean they can bring the knowledge they learn back to Tasmania and provide expert care for raptors. Tas Networks also announced yesterday funding for research that will use GPS systems to monitor eagles and help build knowledge on how to prevent issues with raptors and power infrastructure in the future. It is fantastic to see Tas Networks tackling raptor issues on so many fronts and their enthusiasm to assisting birds that need rehabilitation in general. Next time you are at Bonorong take a look at our top carpark to see some of the mitigation measures in action that they have developed to help prevent incidents with power infrastructure. Thanks for the opportunity to work with you Tas Networks! Today is Penguin Awareness Day! It is pretty rare to find someone who doesn't love a penguin... they are rather adorable after all! When on land penguins are at high risk of predation by dogs, so please make sure you read signage whenever walking your pooch on or near the beach and avoid areas where penguins nest. At sea, penguins are vulnerable to hazards such as discarded plastics and fishing line. It is so important to dispose of rubbish responsibly to ensure we are keeping our oceans safe and clean for the animals that call it home. Boat strikes and oil pollution are another big problem for penguins. We like to tell the boat lovers out there to make sure you "go slow for those below" when you are in known penguin waters. And lastly habitat destruction is another big one that can cause issues for our penguins. People can easily trample important nest sites which are crucial for their breeding success, so again if you are in a known penguin area then please don't wander off tracks and risk damaging their homes. Bonorong has a specially designed Seabird Rehabilitation Facility on site with a large saltwater pool for penguins. The photo below is of a Fiordland Penguin who was in care with us last year. Photo by Liz Pulo. We hope you have all had a wonderful day! Greg (our Director) and Petra (our Sanctuary Manager) visited the Royal Hobart Hospital today with special guests "Muffin" and "Judy" (the orphaned wombats) to brighten up the day for any patients that couldn't make it home for Christmas. Enjoy the rest of your special day folks and stay safe for the remainder of the festive season! Congrats Greg - Tourism Minister's Young Achiever! What a fantastic evening was had by all last night at the 2016 Tasmanian Tourism Awards held at Wrest Point Hobart! Although Bonorong did not win the Tourism Attraction award that we were a finalist in (well done to our friends at Pennicott Wilderness Journeys for this one! ), we were overjoyed that our director Greg Irons was awarded the Tourism Minister's Young Achiever Award! "I would like to thank all of the Bonorong family. The rescuers, the supporters and of course most importantly the staff. Any award we win belongs to every one of you, as a few good ideas on paper are nothing without all of you behind it. To the Bonorong staff, you are truly the cogs of so many incredible things that we are achieving for wildlife and conservation and you are all such an amazing bunch of people. Though we did not win our category you all know how hard you work to achieve the most incredible things on a daily basis and can relax everyday knowing that you save, educate and provide relief to so many animals in need that simply never have the voice and support they thoroughly deserve. To my family, you have always been there with your unconditional support and believing in every single thing that we put our minds to and encouraging us so whole heartedly. Particularly my parents, who many will not even begin to know how integral they have been to everything we achieve, starting simply with the belief we could do it and getting behind us. But my most important message today is if we look at many of the award winners last night they all rely so heavily on Tasmania being the beautiful clean and green place that it is. Tourism is surging forward while so many unsustainable industries flop. I desperately hope it is yet another obvious reminder that we need to protect our natural places and wildlife. It is what our award was given for, so let's hope to see the demise of seemingly endless and often extremely short sighted decisions being made in Tasmania. Stand up for this place and stand up for what is right. Make sure you are all a voice and a loud one at that. Thanks all - Greg Irons." Did you know that September has been 'Save The Koala Month'? And since today is the last day of September we thought we should do a shout out to our koala friends! Koalas are not native to Tasmania, but they still need our help and protection. Listed as a vulnerable species, habitat loss is the greatest threat to this furry icon. Approximately 80% of Australia's eucalyptus forests (which is what koalas call home) has been cleared, and of the remaining 20% almost none is protected & mainly occurs on privately-owned land. There is currently no legislation, anywhere in the country, that can protect koalas and koala habitat in Australia. Photo thanks to Liz Pulo. Yesterday we learnt that the Eastern Quoll has finally been moved from 'Near Threatened' to 'Endangered' on the IUCN Red List of Threatened Species. This has been long overdue and the decision was made because their population is continually declining, by an estimated 50% over the past 10 years in fact. Eastern quolls can only be found in Tasmania as they became extinct on mainland Australia in the mid-1960s. Our Sanctuary is a part of a Tasmanian breeding program along with Devils at Cradle, Trowunna Wildlife Park & East Coast Natureworld who are all working together to help secure Eastern Quoll numbers. 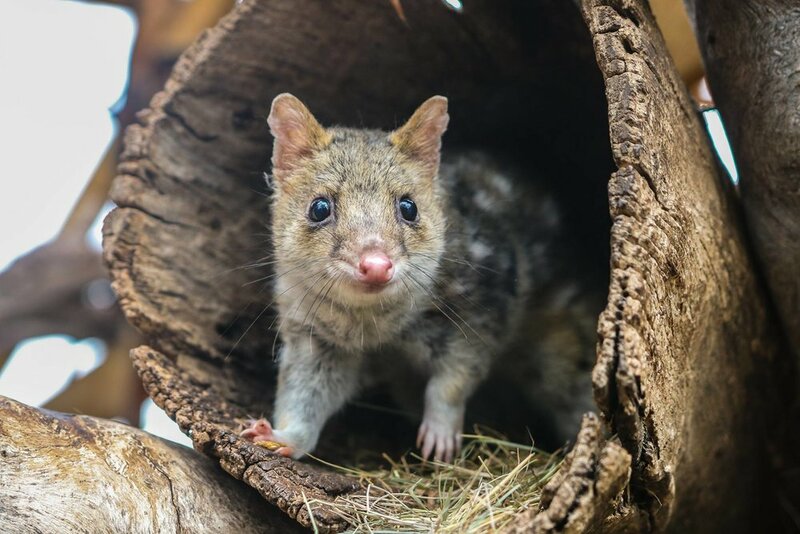 We have also partnered with mainland conservation institutions such as the Mt Rothwell - Biodiversity Interpretation Centre to help ensure the future of this beloved carnivorous marsupial. This breeding season we are very proud to have produced eleven quoll offspring to assist with the breeding program. Have a look at the gorgeous photo below of one of the babies getting their health checks yesterday.